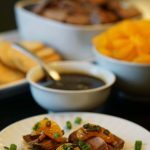 Slow Cooker Roast Beef Bites - are sweet & spicy w/ big meaty flavor.The coolness of the mandarin & green onions are the perfect combination to brighten the flavors! Spray your slow cooker with non-stick coating and put the roast in first. Peel & slice the yellow onion and spread it over top. Remove the roast from the slow cooker (reserve sauce) and refrigerate when cool. Take the remaining sauce and strain it to remove all the bits. Then put it over the stove in a medium sauce pan. Bring to a boil & reduce to a bubble, simmer until it is reduced by half and it is thick and syrupy 15-20 minutes. To assemble slice the beef, top each RITZ® Cracker with roast beef, a mandarin slice, drizzle with sauce and top with sliced green onions. Enjoy!